Earlier this month, I left my humble west coast abode and headed 4,000+km east for a week with my bestest buddy from university. The plan was to spend a night in Montreal, a night in Ottawa and then head to her cottage in Quebec. Although the focus of the trip wasn't beer, and we only really had one day in each city, I figured there had be some way to work a beer adventure or two into the agenda. And luckily, I was right. We started with Montreal. Although we only had 24 hours in the city, I was determined to get at least a taste of fresh local beer on my lips. And so, after a quick meal at my favourite cheap Montreal eatery, we headed to Dieu du Ciel, an artisinal brewpub in the Plateau area of the city. The afternoon we arrived at Dieu du Ciel was hot & sticky, but we were able to snag seats on the partly-shaded terrace, which lies just across the sidewalk from the pub (a concept I've always wondered why Vancouver never embraced). 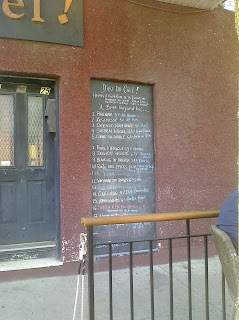 Their current beer list was displayed on a chalkboard on the wall of the building - 16 different beers, all brewed in-house. I was salivating. Rosée d'hibiscus: This beer is all kinds of tropical in your mouth on a hot summer day. Fresh, flowery aroma and pinkish hue come from the addition of hibiscus flowers during the brewing process. Fruity, yet with a hint of tartness and bitterness. Citrusy and spicy. Finishes nice and sweet. Definitely not for everyone, but fruit beer fans - you'll dig it. La Noce de Soie: Another unique offering, this brew is seasoned with Japanese pepper. High ABV (7%). Sweet, with a honey-like aftertaste, but also spicy. Took a few sips to get a handle on what was happening in my mouth, but by the end of the glass I was won over. Corné du diable: Tasty westcoast-style IPA. Full-bodied, red in colour; dry hopped for an extra hop punch. Nice and bitter. Solstice d'été aux cerises: I'm not the biggest fan of sour beers, but this German-style sour wheat was good. Real good. Sour, but not tart. Bright cherry hue, sweet candy nose and smooth mouth feel. The fruit seemed to balance out the sourness rather than accentuate it. Definitely tasty. I only wish I'd had the time (and the fortitude of liver) to sample them all. Luckily, Dieu du Ciel sells bottles in stores around Quebec, so I was able to pick up a 6-pack of the Rosée d'Hibiscus for our upcoming weekend at the cottage. Perfect summer afternoon beer. With our single night in Montreal sadly over, we hit the road, headed ouest for Ottawa. We were just a few kilometres over the Quebec-Ontario border when we passed a sign that said "Brewery: next exit". It was - quite literally - a sign. We had to stop (despite the fact that it wasn't yet noon). And thus, after getting lost in a vortex of Ontario farming towns, stopping to ask for directions from a gas station employee who had never heard it of (even though it ended up being about 5 km away) and a lot of cursing, we finally pulled up at Beau's All Natural Brewing in the quaint town of Vankleek Hill, Ontario. Beau's is, as the friendly girl at the bar told us, a family affair - it was started by a father and son team 5 years ago. Today, their German-inspired brews are poured all over Ontario. Besides using 100% organic ingredients sent direct from the motherland, they're also committed to sustainability (said the bartender, as she poured my pint into a compostable corn cup); their program called Greener Futures gets local beer drinkers to pay in advance for bottles of their special whiskey-infused seasonals, with a little extra money on top that goes towards buying solar panels for the brewery. They also have a massive Oktoberfest celebration (with keg tossing!). All in all, they're pretty much the coolest little brewery I never knew I was looking for. Lug Tread lagered ale: A light, golden German-style lagered ale. This is Beau's flagship brew, and tastes distinctively German - I got the flavour of grains, maybe even straw? Light hop finish. It's crisp, and very refreshing. If you can find it on tap in Ontario, definitely give it a try. Night Marzen Oktoberfest Lager (Fall seasonal): Lots of German malt flavour, with nice balanced hoppiness. It tasted almost grainy or bready (in a good way). Definitely a worthy harvest-time brew. Yum. Dunkel buck: At 6.9% ABV, the Dunkel buck is (as expected) quite sweet. Almost a dessert beer. Not sure I could get through more than one in a sitting, but would be perfect as an after-dinner or cold-weather pint. But alas, after a pint and a bit of lazing about on the garden patio, we had to get back on the road towards Canada's capitol city. My initial research on craft beer in Ottawa didn't inspire much hope. I found listings for 3 breweries... one of which was actually across the river in Quebec. So that left two. After realizing that Kichesippi was a bit too far out of town to work into our evening's plans, I settled for giving their blonde a try on tap at a bar in the Byward Market. The verdict? Not bad. Not bad at all. But not a top pick in my books. And then there was one: the Clocktower. Luckily, it was a winner. Bytown Brown: This was definitely my top pick. Dark and nutty, but surprisingly light on the tongue. Coffee and chocolate notes. Malt to the max (which is a good thing in my books). Nice light hoppiness. Raspberry Wheat: I love me some fruit beer, especially in the summer. This one wasn't quite as fruity as I'd have liked, but it was nice and light on a muggy summer evening. Straw-coloured, highly carbonated and with the faintest taste of berry. Clear for a wheat beer. Unfortunately, we didn't get to check the first annual Ottawa Beer Fest on my last day in town as planned - as much as we tried, we couldn't muster the energy after a weekend of partying at the cottage. But I have a feeling this won't be the last time I lift a pint glass in Ottawa. Cross-country beer pilgrimage anyone? "one of which was actually across the river in Quebec." excuse you, that is flaw-free Gatineau where I spent my teen years drinking Coors Light. I know your beer heart just died with me mentioning Coors Light. Ah the days I spent working on the Byward Market, I wish I could have been old enough to sample more brews at the time. You have inspired me for my next visit! I loved the Market area. Seemed like way better nightlife than Vancity.